BIG continues to support Perfect Sense Digital with sound masking and structured cabling systems at their Reston facility. BIG’s expertise with installations in Secure Facilities continues with Classified Cabling Systems at undisclosed VA facility. BIG was awarded the Design-Build Services for a Non-Profit Association in Alexandria, VA including voice and data cabling, AV Systems, and Security. One of BIG’s own Account Managers, Ashley Wills, received her BICSI Data Center Design Consultant credential. She is the first woman in the DC/MD/VA Region to obtain this credential, and is one of 13 total in the region. Way to go Ash! Phase II NOC refresh for Verizon Ashburn VA underway. This project includes a Systimax Cabling System, Lencore Sound Masking, and Audio Visual Systems for seven rooms. BIG recently completed its largest Audio Visual deployment – design, install, programming for 50+ rooms at a National Conference Center in Loudoun County, VA.
B.I.G. ranks among Washington Business Journal’s “Top 30 Ranked Veteran-Owned Companies”. We’re honored to once again be recognized for our regional leadership. We’re especially proud of our hardworking and committed team that makes our success possible. New design build project with AV/Wireless/Camera/Sound Masking & Structured Cable Plant Systems for NACD. B.I.G. awarded Weil Gotshal law firm project with Rand Construction. NTT Data selects B.I.G. 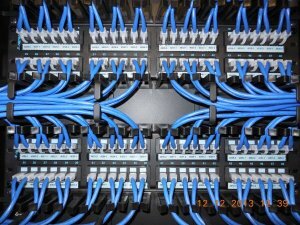 for AV & Structured Cabling Systems projects in Herndon, Crystal City and Tysons Corner. B.I.G. awarded First Potomac Rockville facility conference center and fitness center design build for AV/Wireless & Structured Cabling. USO awards B.I.G. technology systems contract for the 2 Floor project in Arlington, VA. Project includes Audio Visual, Wireless (predictive & active mapping) and Structured Cable Plant systems. B.I.G. continues to support Vencore on both a local and national level with new AV & Structured Cabling projects in VA & CA. B.I.G. awarded new projects with Engility at CA, CO, SC, VA & DC sites. New design-build project with AV Design/Wireless Systems/Camera System & Structured Cable Plant Systems Design and Installation for Sequoia Restaurant in Washington, DC. B.I.G. awarded CityWorth Mortgage Cable Systems project in Fairfax, VA.
B.I.G. awarded new projects with Engility at VA & DC sites. Awarded 3 Crowns’ AV & SCS systems project with Rand. B.I.G. recently completed a design-build project for American Society of Health-System Pharmacists. The project include structured cabling throughout the space and new AV systems in the Boardroom, Executive Conference room, multiple conference rooms and VTC suites, a 3-way divisible conference space, and Executive Offices. There was also a facility wide digital signage system that was implemented. B.I.G. recently completed a design-build structured cabling and AV project for Kettler’s new facility in Tysons Corner. B.I.G. was awarded a design-build contract for structured cabling and AV systems for The National Stone, Sand, and Gravel Association. The B.I.G. AV group is continuing to grow. We are looking for Lead AV Technicians and Field Service Technicians. BICSI introduced the Emerging ICT Professionals Award at the January 2017 conference. 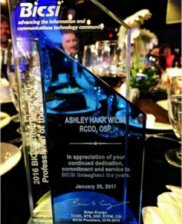 For her contributions to BICSI and her work in encouraging young professionals, B.I.G.’s Ashley Haak Wills, RCDD OSP, was given the award. Ashley is the Vice Chair of the MOD Committee as well as the Chair of the Emerging Professionals Group. She also sits on the Technician and Education Outreach subcommittee. New design build project with AV & Structured Cable Plant Systems for Interaction Headquarters in Washington, DC. B.I.G. awarded MarkLogic Tysons Corner project including AV & Cable systems. B.I.G. continues wireless design training with certifications from Ekahau. Kettler awards B.I.G. AV and Structured Cable Plant for new Tyson office. B.I.G. continues to support Vencore on both a local and national level with new AV & Structured Cabling projects in Virginia and MD. B.I.G. awarded new projects with Engility at Virginia & South Carolina sites. Zenimax Server Room Design Build in progress. Congrats! B.I.G. technician Peter Moskowski is now a BICSI Certified Technician. Well done Pete! Oracle Corporation awards new Systimax structured cable plant to BIG for their Columbia, MD facility. BIG supports Verizon in its consolidation project at their 1.2 million sq. ft. Ashburn, VA facility. CACI awards BIG restack project at the Commonwealth facility in Chantilly, VA.
BIG recently completed two Outside Plant Projects at the Digital Realty data center campus in Dulles, VA.
NOVAVAX awards BIG design-build for 120,000 sq. ft. facility in Gaithersburg, MD. Vencore awarded BIG a design-build contract for AV systems at their Alexandria, VA facility. BIG awarded new projects with Engility at California and Virginia sites. Audio-Video team at BIG continues its rapid growth and has hired new team members. BIG welcomes Chris Bowling (AV Lead Technician) to the team. New Wireless deployments for Northrop Grumman at multiple facilities in Louisiana and California. Congratulations to Alex Merrill for becoming BIG’s most recent BICSI ITS Certified Technician! Going up! BIG technicians recently completed additional hands-on aerial lift training at the Chantilly office. Safety First: The office staff at BIG is not just smart… they can save your life! We are proud to report everyone successfully completed the Red Cross First Aid/CPR/AED certification class. NOBLIS awards BIG design-build for their new headquarters in Reston, VA.
American Society of Health-System Pharmacists awarded BIG a design-build contract for the AV and Structured Cabling for their new facility in Bethesda, Maryland. BIG continues to support Vencore on both a local and national level with new AV & Structured Cabling projects in Virginia and California. Billy Booth, Alex Merrill, David Ortiz, Carl Goodiel, and Caleb Veneklase attended (CFI) Corning’s Fiber Installation class. B.I.G. continually invests in staff training and certifications, including the latest in fiber optic technology advancements. The Disney Institute’s seminar on Quality Service was attended by B.I.G.’s Charlie Grimes, Patrick Kearney, Mike Reese, Ashley Wills, Dana Dodge and Chris Watson. B.I.G. leverages time-tested Disney quality service tools and standards to create an exceptional service experience for our clients. Selected as sub-contractor to build NOC for DC area Government Agency. Operating 24x7x365, the NOC will feature the latest in AV technology including a 3×3 Planar video wall, a Crestron DM matrix switcher, and an easy-to-use control system to manage everything. B.I.G. will deliver all AV design, procurement and integration services. B.I.G. selected to install, terminate, and test cable infrastructure in the Extron Electronics Demonstration and Training Center in Chantilly, Virginia. Completed new Geico training facility in Ashburn, VA. Awarded JP Morgan Chase office build-out in Richmond, VA. Completed expansion project for FGMC in Frederick, MD; awarded expansion project for FGMC in Tysons Corner, VA. Recently been awarded multiple data center projects at Equinix and Digital Realty. Awarded retrofit PONs cable installation project for Leidos in Columbia, MD. B.I.G. 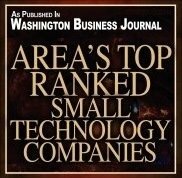 ranks among Washington Business Journal’s “Area’s Top Ranked Small Technology Companies.” We’re honored to once again be recognized for our continued growth. We’re especially proud of our hardworking and committed team that makes our success possible. Awarded structured cabling systems, security and AV contract for new Perfect Sense Digital facility in Reston, VA.
B.I.G. lands contract for AV solutions, Wireless and Structured Cabling for Sucampo in Rockville, MD. Wireless Rollout contract continues at additional facilities with undisclosed client in Maryland. DarCars brings in B.I.G. to deliver structured cable plant, security and AV solutions to new headquarters in Bethesda, MD. B.I.G.’s AV presence continues to expand with the award of Teaching Strategies project in Bethesda, MD.